LA PAZ – The government of Evo Morales on Sunday annulled the concessions to exploit forest areas in a portion of eastern Bolivia and handed over more than 200,000 hectares (500,000 acres) of those lands to the Guaraya Indians. Morales attended the ceremony to turn over the lands and forests in the town of Ascension de Guarayos, in Santa Cruz province, which borders on Brazil. 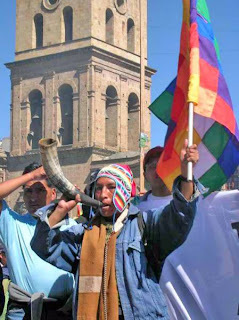 In his speech at the event, Morales emphasized that his agrarian reform plan is part of his effort to provide “equality” to Bolivians, and he asked the Indians to organize themselves to defend their lands. Land Vice Minister Alejandro Almaraz said that the lands that were turned over to the Guarayas had been in other hands for some time despite the fact that Bolivian law protects the community property of the country’s ethnic groups. Almaraz said that “there can be no private companies” in the region, no matter how much they might be practicing sustainable exploitation of the forests, because the Indians’ right to the land overrides that consideration. However, he also announced that the titles to more than 30,000 hectares (75,000 acres) would be given to agri-businessmen in the same region because they were adhering to and helping carry out the agrarian law.